(Nanowerk News) Using a carbon nanotube instead of traditional silicon, Cornell researchers have created the basic elements of a solar cell that hopefully will lead to much more efficient ways of converting light to electricity than now used in calculators and on rooftops. The researchers fabricated, tested and measured a simple solar cell called a photodiode, formed from an individual carbon nanotube. Reported online Sept. 11 in the journal Science, the researchers -- led by Paul McEuen, the Goldwin Smith Professor of Physics, and Jiwoong Park, assistant professor of chemistry and chemical biology -- describe how their device converts light to electricity in an extremely efficient process that multiplies the amount of electrical current that flows. This process could prove important for next-generation high efficiency solar cells, the researchers say. "We are not only looking at a new material, but we actually put it into an application -- a true solar cell device," said first author Nathan Gabor, a graduate student in McEuen's lab. Shining lasers of different colors onto different areas of the nanotube, they found that higher levels of photon energy had a multiplying effect on how much electrical current was produced. Further study revealed that the narrow, cylindrical structure of the carbon nanotube caused the electrons to be neatly squeezed through one by one. 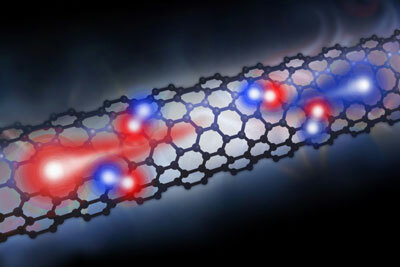 The electrons moving through the nanotube became excited and created new electrons that continued to flow. The nanotube, they discovered, may be a nearly ideal photovoltaic cell because it allowed electrons to create more electrons by utilizing the spare energy from the light. This is unlike today's solar cells, in which extra energy is lost in the form of heat, and the cells require constant external cooling. "What we've observed is that the physics is there," he said. The research was supported by Cornell's Center for Nanoscale Systems and the Cornell NanoScale Science and Technology Facility, both National Science Foundation facilities, as well as the Microelectronics Advanced Research Corporation Focused Research Center on Materials, Structures and Devices. Research collaborators also included Zhaohui Zhong, of the University of Michigan, and Ken Bosnick, of the National Institute for Nanotechnology at University of Alberta.